58-year-old male presents to the Emergency Room with shortness of breath and chest pain. The pain radiates to the left shoulder and is mildly improved after 4 mg of IV morphine. He is saturating in the low 90’s on 2L nasal cannula. The patient has a history of hypertension and gout. He was also recently diagnosed with colon cancer that is metastatic to the liver. 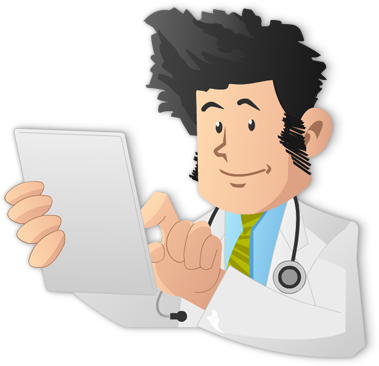 His blood pressure has been reasonably well controlled on losartan and metoprolol. Additionally, he is now receiving bevacizumab and 5-fluorouracil from his oncologist. 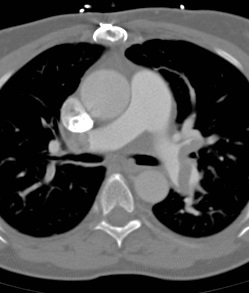 A single axial enhanced CT slice through the chest is provided. What is the patient’s diagnosis? The patient is hypercoagulable given his malignancy and use of bevacizumab, both of which increase the risk of DVT. The CT above demonstrates filling defects in the bilateral pulmonary arteries consistent with pulmonary emboli (Choice A). Although the patient’s recent use of chemotherapy may make him more vulnerable to infections, the CT does not demonstrate a pulmonary infiltrate consistent with pneumonia (Choice B). Neoplasms of the pulmonary artery (Choice C) are extremely rare. However, when they do occur, the most common pulmonary artery malignancy is sarcoma. The patient’s shortness of breath and the character of his chest pain are atypical of aortic dissection (Choice D). Further, the provided CT does not offer any evidence of dissection.